Dr Kristine Kay is a joint academic-industry postdoctoral research associate working in the lab of Dr. Mary Ann Lila, director of the Plants for Human Health Institute (PHHI). Kristine characterizes dietary bioactive compounds by applying expertise in bioanalytical techniques such as mass spectrometry (MS), high-performance liquid chromatography (HPLC), nuclear magnetic resonance (NMR), molecular spectroscopy, protein biochemistry, kinetics and functional assay development. The Lila lab focuses on defining the mechanism of action of plant-derived bioactives upon health and the incidence of disease. Here, Kristine characterizes dietary polyphenols and secondary metabolites derived from fruits including blueberries, blackcurrants, raspberries, cranberries, pear and banana. In addition, her experience in protein functional and kinetic characterization is applied to studying the structure-function relationships of hypoallergenic colloidal aggregates derived by the Lila Lab. 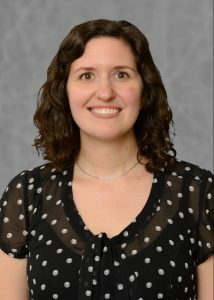 Kristine also serves as the link in collaborative bioanalytical research between PHHI and Dr. Nicholas Gillitt, director of the Dole Nutrition Research Laboratory. Here, Kristine studies the structure and activity of biomolecules derived from banana and pineapple, their metabolites and their impact upon human health.